There is an old saying about poor cooking: “Tastes like hospital food.” I suspect that this really doesn’t have currency nowadays. 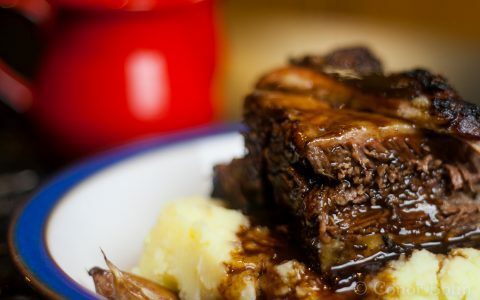 Generally speaking, the food served in Irish hospitals appears to be a pretty good mix of carbs, proteins and other goodness designed to keep the patients in reasonable health until they depart the hospital or the world. This was not always the case. My late father was, amongst many other things, a pathologist. For some years, he operated from a lab in the basement of the Richmond Hospital in Dublin city centre. In my 20th year, I got an attack of acute appendicitis. This was back in the 70s when this meant being rushed to the hospital and having a large incision in the gut to remove the offending and offensive organ. The truth of it was that each morning, a bustling doctor in a large white coat would visit my bed, pull around the curtain while saying in a very loud voice “Now Mr. Bofin, let’s see how you are doing today.” He would then sit on the side of my bed and take out my home cooked lunch from the recesses of the over large white coat. Yes, it was my father, visiting from the labs below. We would chat for a while and Dad would take away the previous day’s plate to avoid suspicion being aroused. My friends blew this for me and I ended up having to take the hospital food and sneak it (very painfully with my festering wound) into the toilet for disposal, so I could enjoy the secreted lunch each day. After all that, I guess I owe you a recipe. How about Chicken Liver Paté on Toast Melba? This liver is not that far from the appendix but It’s as far away from that hospital food as you can get. This is my late father’s recipe, as best we could recreate it. I did it with my Mum and we both enjoyed the experience a lot. 6 or 7 streaky bacon strips. I forgot about half the ingredients in my enthusiasm for the shot. You will also need a strong stomach because there is a bit of gore in the preparation. First chop the onion, mushroom, garlic and thyme. 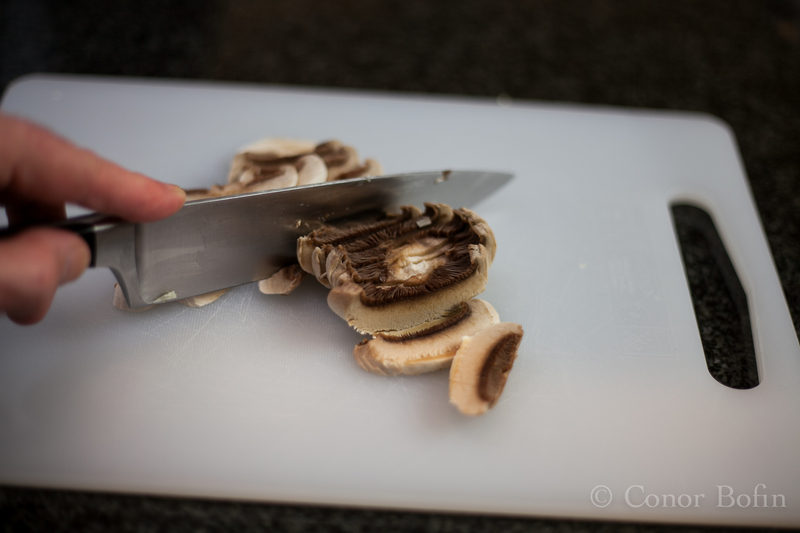 A nice shot of a mushroom being chopped. This is to soften you up for the gore. 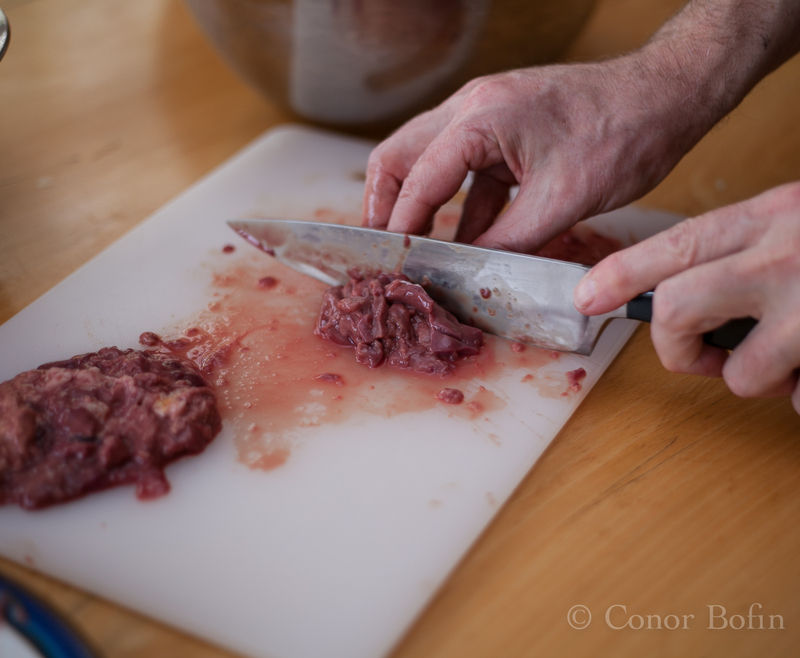 Then roughly chop the chicken livers, discarding any extraneous bits that you would not like to find between your teeth. There’s no way around the rough chopping if you want a nice textured paté. Be a Jessie and blend it for Brussels Paté if you wish. They don’t look much better after they’re chopped. 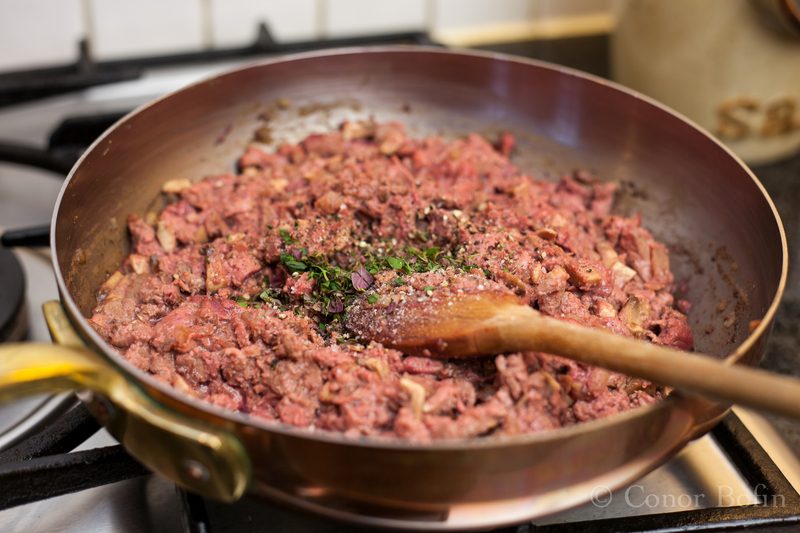 Yes, you can tell your grandkids that you saw a bowl of chopped chicken livers here on One Man’s Meat. Gently fry the onion until it is translucent. 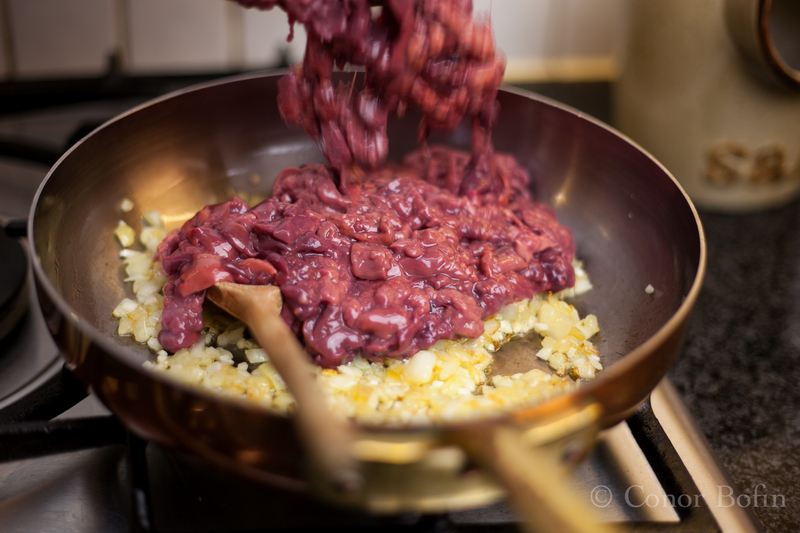 Add the chopped livers. This warrants not one but two pouring shots for the fans of such like. Pouring shots don’t get much grosser than this. It’s enough to put you off your food. Pouring shot number two. Things improve after this one, I promise. The livers firm up quite a bit when fried. They also have a beautiful aroma when fried with the garlic and a dash of brandy. 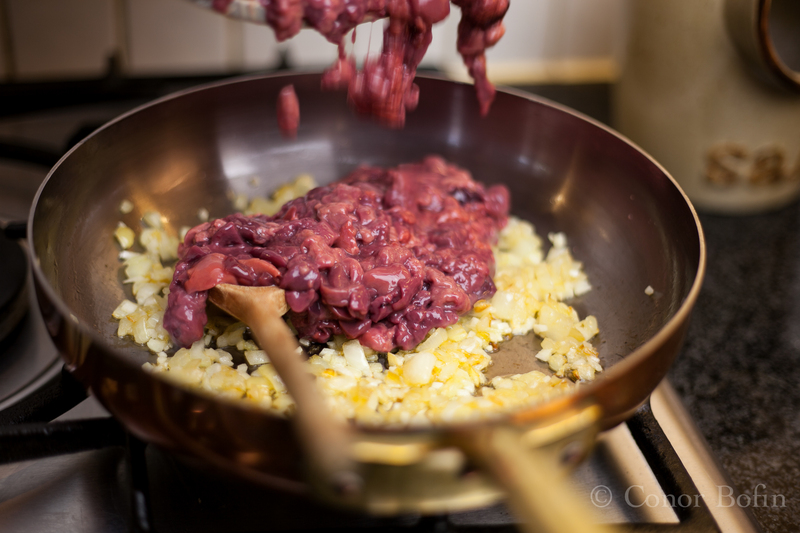 I added the garlic at the same time as the livers. It’s under there somewhere. Next I added the mushroom, thyme, salt and pepper and a splash of Cognac to bring an extra dimension. My mum grated about a quarter of a nutmeg into the mix too. It was on the pan for about four minutes total. 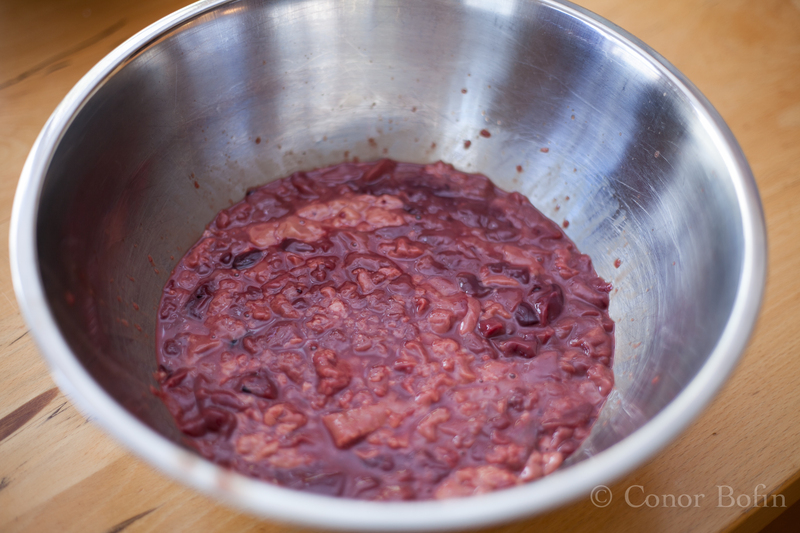 Starting to look like a real paté at this stage. I told you things were getting better. 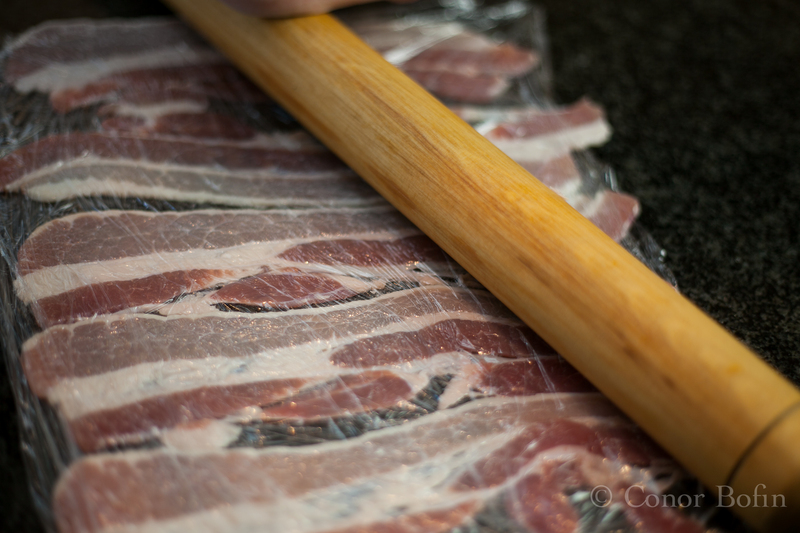 Next, we bashed a few rashers of bacon (between two sheets of cling film) with the rolling-pin. 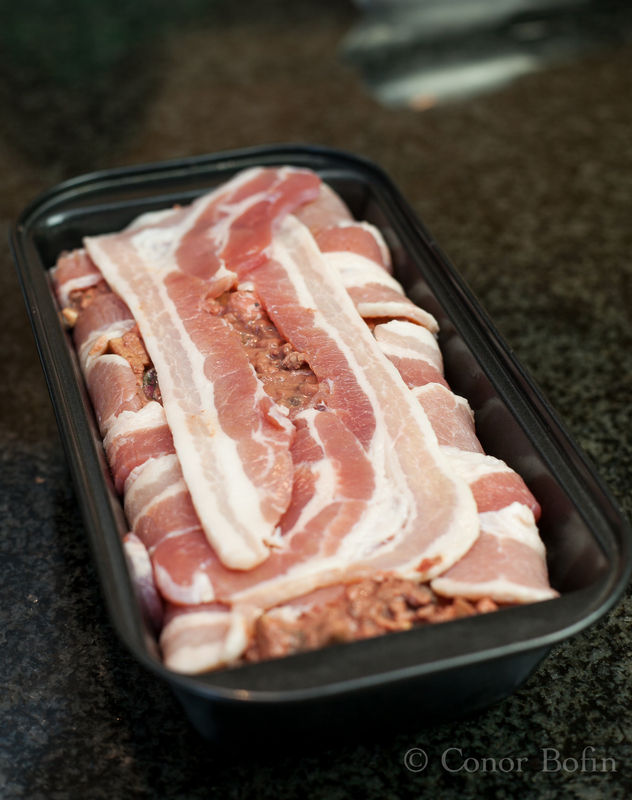 The bacon needed to be flattened to allow it to line the baking tin. Next we spooned the mixture into the tin. This warrants a couple of shots too. 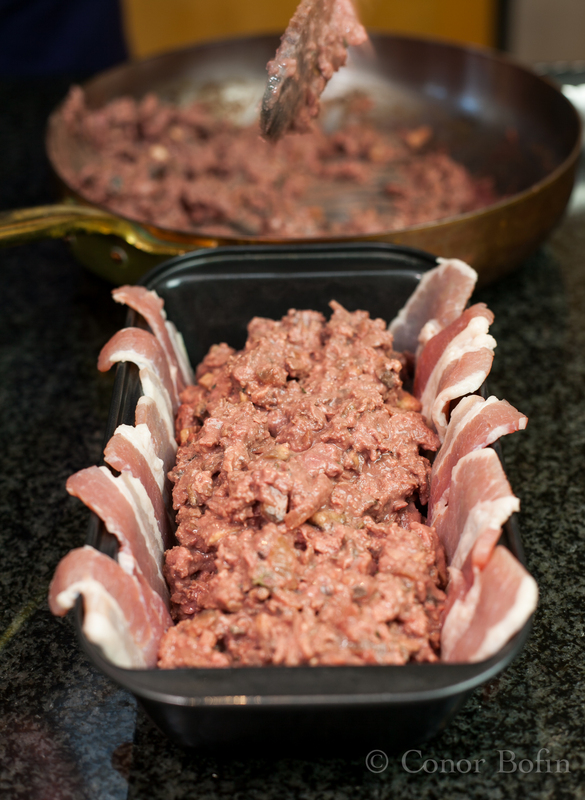 The tin is lined with bacon and we add the paté mixture. Given that we used a 1 lb loaf tin and started with 1lb of chicken livers, it fits pretty well in the tin. A nice full roasting tin. My final action shot of the post. 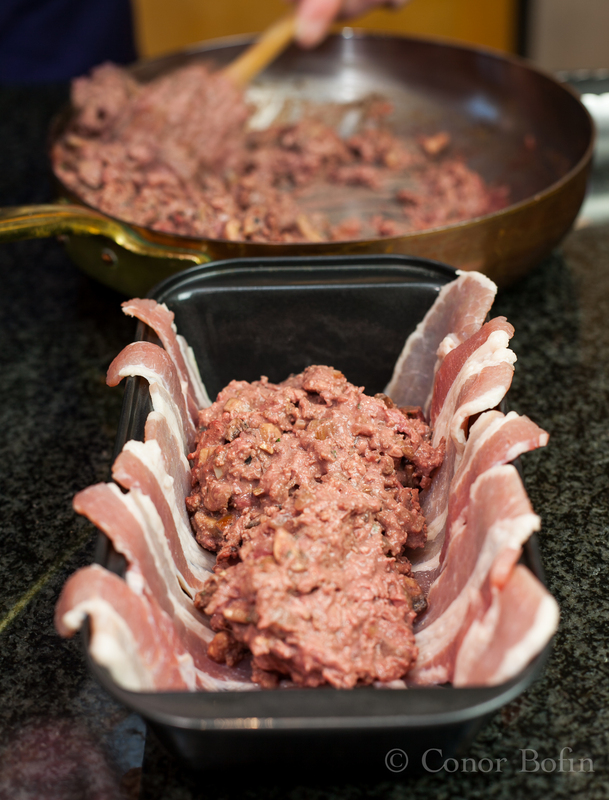 Next, we fold over the bacon as best we can and add a couple of extra strips. This then goes into a Bain Marie (water bath) and is placed in a 200°C oven for an hour. When it comes out, it looks like this. Very difficult to avoid attacking it with a spoon at this stage. It needs to cool down first. We put it in the fridge overnight after it had cooled. The next day, we made the Toast Melba. This is really easy. Toast some plain white bread on both sides. 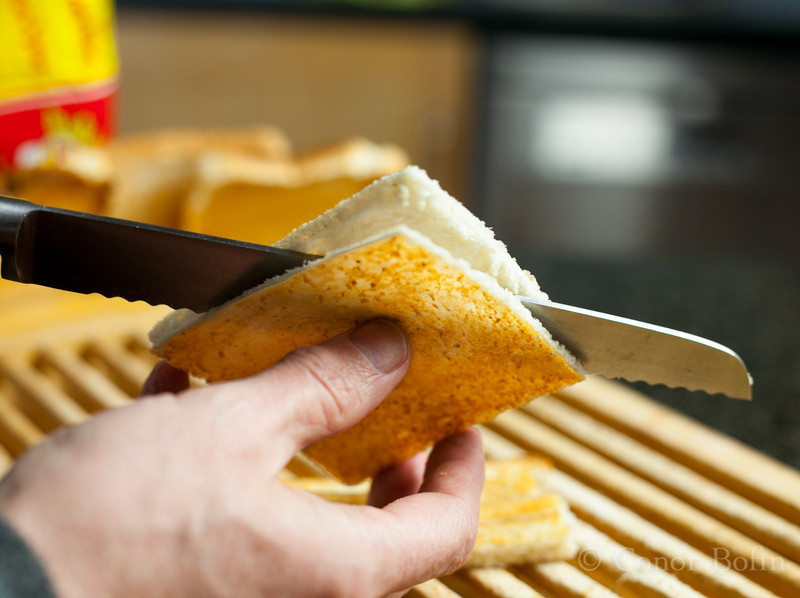 Cut off the crusts and slice each slice in half – through the bread. Have a look at the photo to see what I really mean. This was really popular in the 1970s. Toast Melba sounds so exotic. 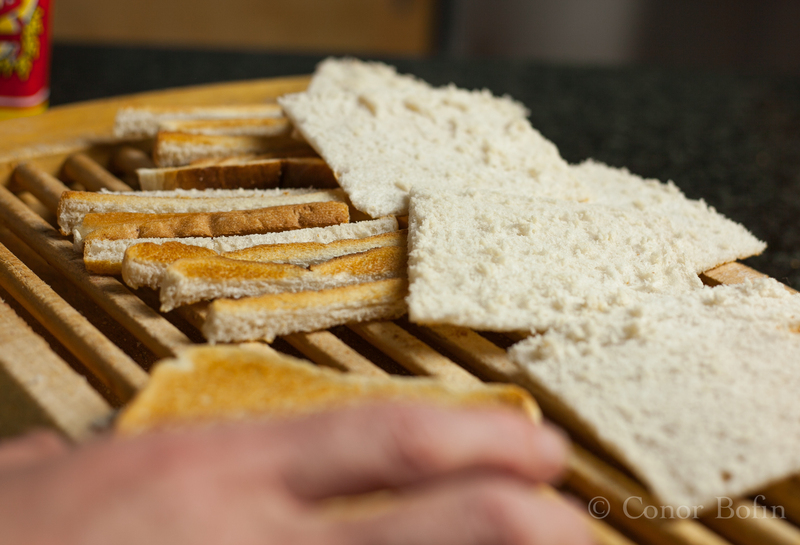 Then toast the exposed sides of the slices. Hey presto, Toast Melba! It’s very difficult to not eat those crusts while you wait for the toast to cook. Now the bit you have been waiting for. 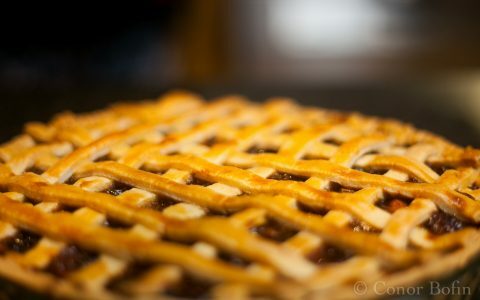 The finished product, straight out of the tin. I had to pop it back into the water bath for a couple of minutes to break the seal between the bacon and the tin. I have cooked many fine dishes over the years. This is right up there with the best of them. It was wonderful to cook my late father’s recipe with my Mum after so many years. We did it from Mum’s memory and the end result really was awesome. It made me really proud. I suppose a plated shot is called for in celebration! 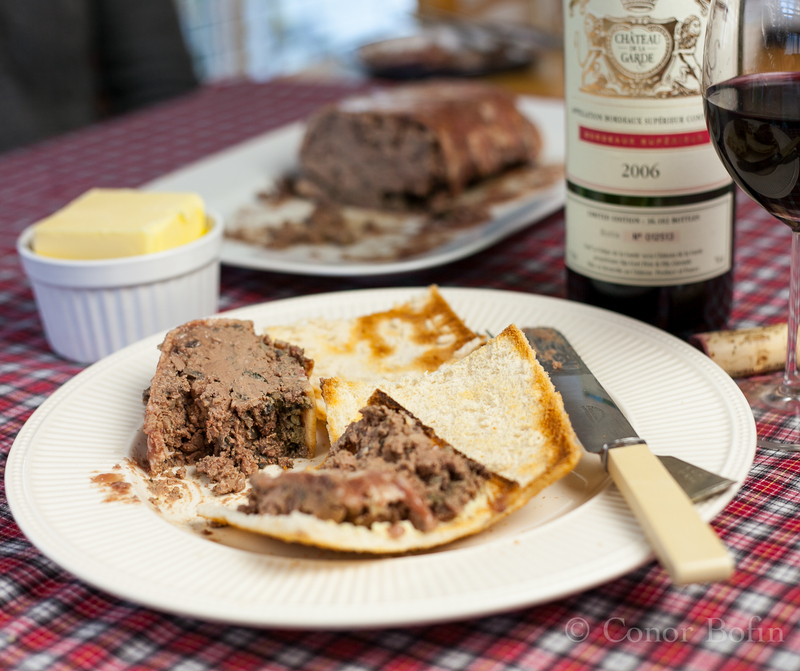 The rough paté was delicious on the Toast Melba with some butter and a decent bottle of Bordeaux. I told Mum the story of the onions and of the secret hospital food deliveries. She had never heard either before. Typical of my Dad. Mind you, he didn’t hear the onion story from me either. Lovely. 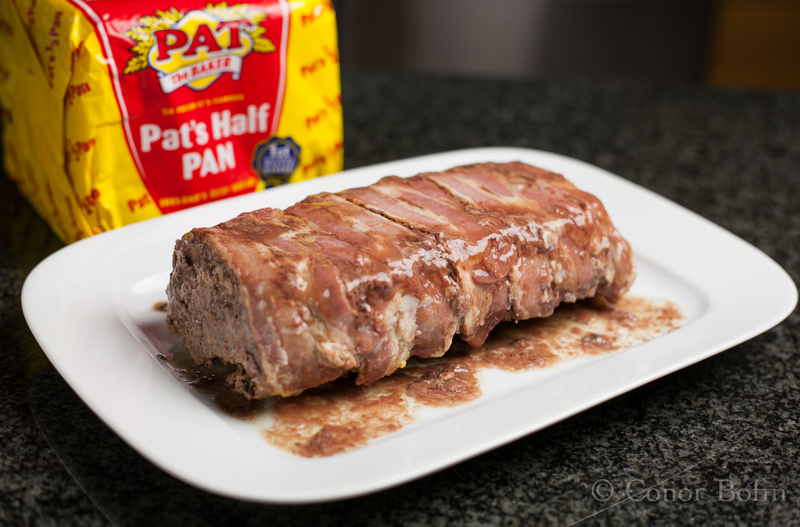 All news to me too, but happy memories of the pate. Side note: Toast Melba is not to be sniffed at. 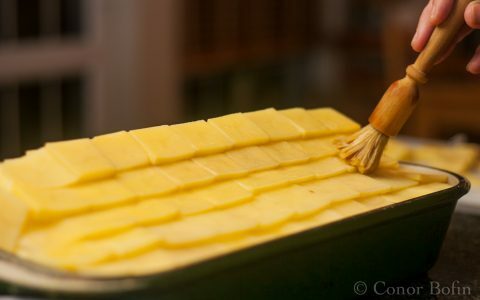 When working at Chez Sylvio I was in charge of preparing it. Had never heard of it before. Very impressed I was. Ah, Chez Silvio. That brings me back to a distant time. Te Toast Melba brought me back too. Have not had it in decades. What do you mean: 1970s? I certainly have never stopped making it!! Yours looks moreish and on the way to being a terrine! Fun local hospital story [food in Oz hospitals can be pretty horrible bye-the-bye! ]: My local hospital is 40 km away in a pretty posh ‘spa’ town. Lot of the wealthy from Sydney have weekend ‘mansions’ there with staff, including chefs, oft at loose ends during the week. Guess from where they make a ‘second’ living: cooking for the private hospital 🙂 ! One reason we try to stay in an otherwwise wretched place another day or two: food fit for foodies 😀 ! I love the concept Eha, staying in hospital for the food. It would have been a first in 1970s Ireland. I remember my mother in-law being admitted to a heart hospital near Philadelphia. The place was huge, with reminders everywhere about how heart disease was a killer. One day, my wife and I went to the cafeteria to get ourselves some ‘heart hospital’ fare and found that they served most everything deep fried. It was a delicious experience. Then it must be good for you Adam. Te medical profession would not allow it if it were not. Would they? 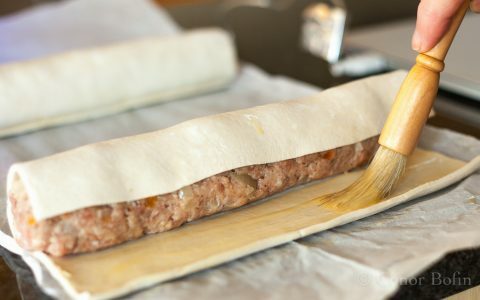 Beautiful pâté! I’ve never thought to roll out the bacon! Thanks Mimi. It was pretty tasty indeed. Hospital food hasn’t changed. Last summer while spending a spell on daily visits to hospital I noticed that two of the patients on the ward had friends and family bringing in McDonalds for them. I was amazed but not as amazed when I saw what the hospital was serving up!! The picture of the pate straight out of the oven looks very desirable. Hi Maria, It really would be a difficult choice for me, seeing how many hospital regulars get there from the burger, fries and supersize me diet. Your friends were wrong.. you need to wrap toads in yellow paper and place them in the bed to help the rcovery from appendicitis. Thanks be to goodness you can only get it once! Beautiful! I think truffles would be excellent too! Nice post. My ex-wife made some years ago which I took into work with bread to toast. When I unwrapped it the garlic smell was so strong I knew I couldn’t eat it and carry out the interviews I had planned for latter. I went hungry that afternoon, but really enjoyed it that evening. I hasten to add that putting too much garlic in the pate was not the only reason for the break up. 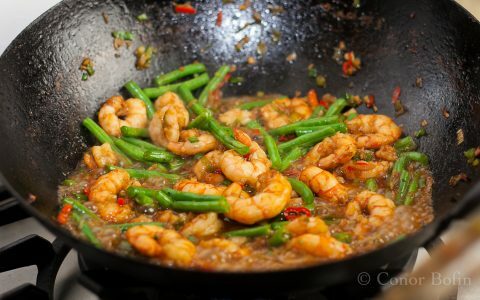 Not quite as fond a memory as yours, but a damn good dish anyway! I would have had difficulty not eating the garlic infused pâté and making the interviewees suffer. 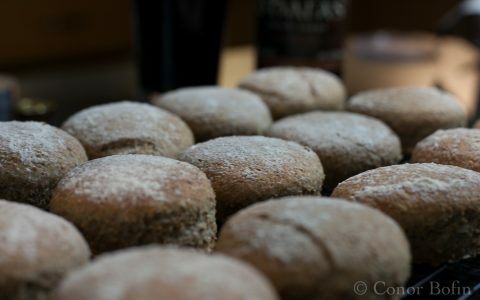 Interesting recipe… Mrs K and I used to make industrial quantities of chicken liver paté for the local deli (a curiosity shop then) when we first arrived in Clonmel in 1975. The livers were almost free, as were crabs minus claws from Dungarvan and other alien bits not endemic to local cuisine. We fried them off briefly with crushed garlic, added loads of butter and cooking brandy (£3 a bottle? from Grants my employers) whizzed in a food processor and chilled. Smoother and less terrine-like than your Dad’s recipe, but delicious and we had trouble meeting demand… those were the days. Brilliant story Pip. I can just imagine what a metropolis Clonmel was back in ’75. I am amazed you managed to shift any of it. I have a post upcoming about crab claws that I bought minus the crabs. But, that, as they say, is a different story. Just a little bit of flavour. Some do, some don’t. This time I did. Maybe next time I won’t. Keep the onions in the pate. But what about the onions in the hospital bed? That, I will never know. Though it gave the lads a good laugh. Man, every one of your posts lately has blown me away. That is certainly not hospital food, and I appreciate the rather lovely story you treated us to, completely with both father-son and mother-son bonding. Truly great stuff. Thanks Tommy, a special post for me too. Great to be able to rekindle those memories while cooking under my Mum’s guiding hand. There is another post in that MD I lived near enough to be able to go home for lunch most days. Nice, Conor! The liver shots are indeed gross. Must have been a nice trip down memory lane to recreate this together. You did get my attention right away because I feared you may have ended up in hospital. Thanks Stefan. I appreciate your concern! Good on you. They can be tasty. We grew up across the road from a popular beach. Each summer, Mum would try to avoid the populace knowing that there were two doctors living in the house. Though, they were kept busy enough patching the six of us. 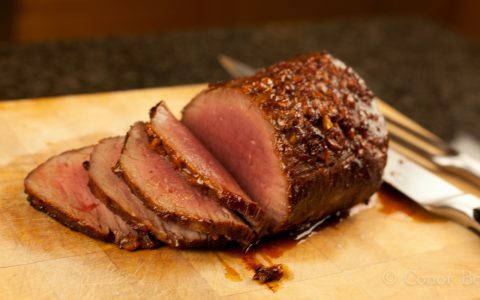 As an assistant to a butcher years ago, in a very large hospital in Dumfries, Scotland one of my chores was to slice semi-frozen liver. Never again. 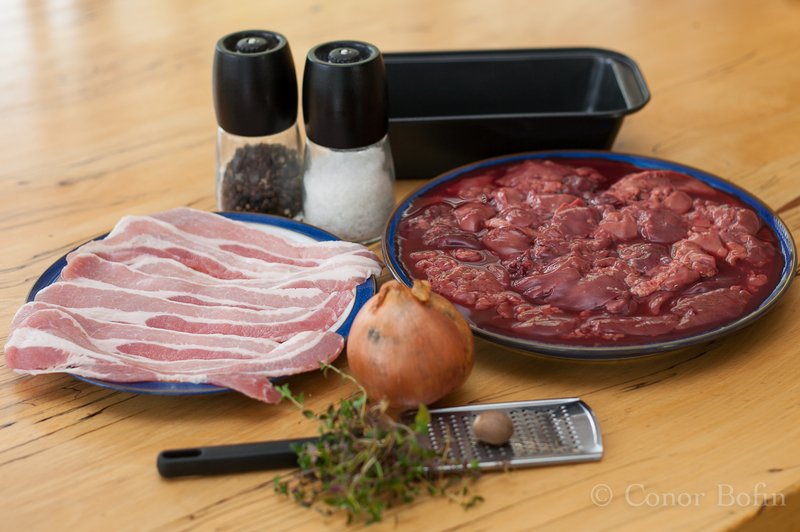 The last time I made anything with chicken livers I blanched them first. So much easier to deal with and less gore! Do like a good Paté. Thanks Johnny, it was pretty gorey indeed. Worth it for sure. A great post, Conor, and wonderful story of your Dad. He must have really been something and what special memories to have. This paté looks pretty special, too! Thanks John. He was a very special man. Blegh! Watching you prepare those livers was tough the first time and that’s without a night of over enthusiastic sampling of Budapest’s digest pubs… Wish I had some here though all the same. It would be well-tasty! Thanks you Danny. Join in anyway. Hilarious, I snuffled with laughter all the way through that. I love the idea of your pathologist dad smuggling in the home-cooked meals. I had appendicitis when I was six and all I remember about the food (in an English hospital) was being allowed to eat the ice cream the kids in the tonsillitis ward couldn’t get down. That, and developing a bizarre liking for a milky drink called Milo. I wonder if they still make it? 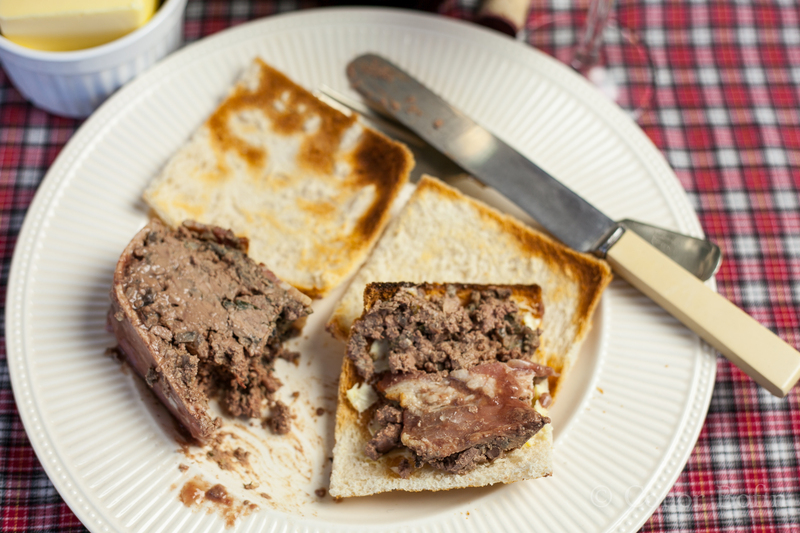 The pate looks delicious – must be serendipity as I have a tub of chicken livers in the fridge awaiting my attention. I had my tonsils out about 45 years ago. It was not a pleasant experience. The gas back then was pretty sickening. Ice cream was the last thing on my mind. Though, I do have memories of red jelly. 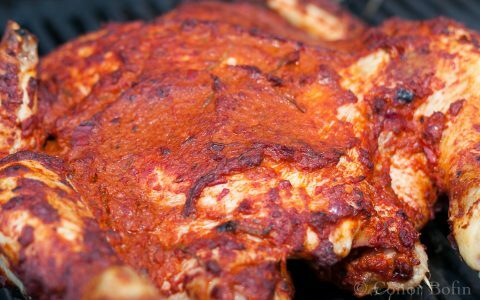 I’m severely tempted to make yours, it looks so good, but I already have the ingredients for the smooth paté I was planning. Decisions, decisions. I’ll keep you posted (sic). What a great story! Sweet memories of your dad… Your chicken liver pate looks quite yummy! 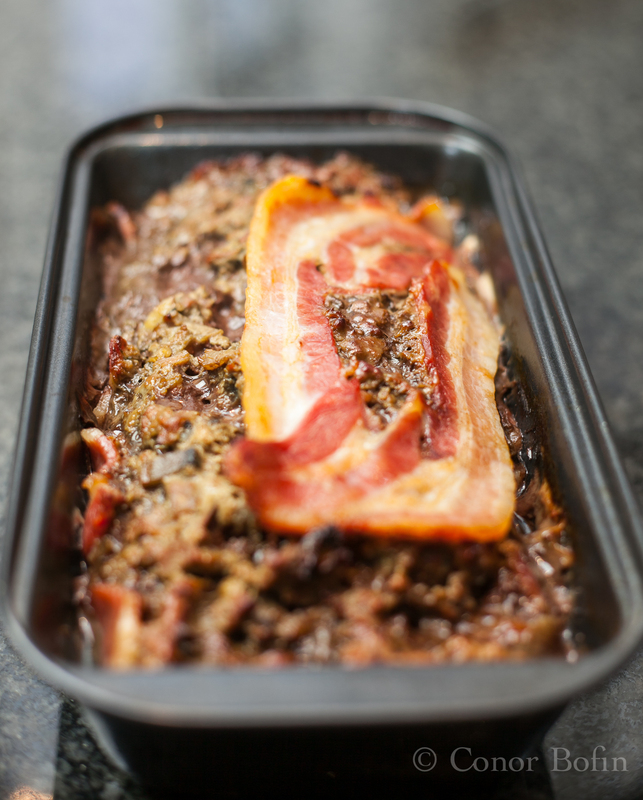 Looks like meatloaf… I wonder if I could pass it off as such to hubby?! Yes, indeed. Deep fried food only. You are hereby accused of making me drool in public ! I used to have that effect more when I was younger! I love this story. What a great guy your dad. I did take an unfortunate pause in the reading of the story at “For some years, he operated from a lab in the basement”. Imagine my relief as I continued reading. 😉 The pate looks amazing and I am not a liver person (squeamish American). I’m pretty sure I could be convinced to try it. 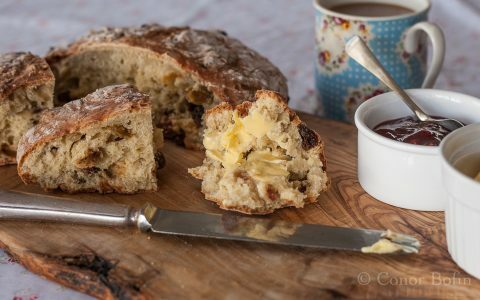 It is beautifully tasty and well worth the little effort. My Mum, the Wife and both daughters tell me so. I enjoyed it too. 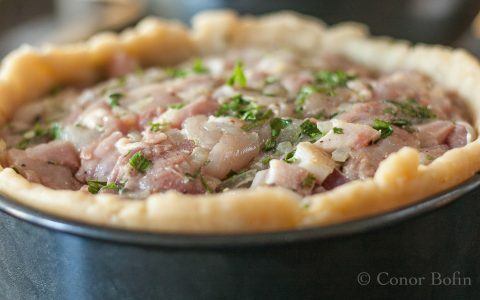 If you can get chicken livers, give it a go. Here it is! I’ve been waiting for your recipe since your mentioned. It is quite different in the sense of how it is made as well. I have to give this a try. Anything that has bacon in it needs less persuasion for me. The texture seems chunky on the photos. Is that correct? Nice little memoir too! Waiting on the Peach Melba next! It is quite chunky. That suits the mushrooms that end up the same sort of size in there. I am going to do a smooth version very soon. Your post has made that an imperative. you have some funny friends! the little hospital food I’ve had so far hasn’t been too bad, but I sometimes cannot take the hospital smell!!! Lol, I’m very proud of my countries national treasures. If we have contributed to the world and its appetisers I’m happy. Really enjoyed the story of your dad and the onions…chuckled alot! Thanks Alice. He was a great man in many ways.